The silver lining to my celiac diagnosis a few months back was that it kicked our kitchen projects into gear. Since our home budget was going towards replacing all our kitchen items that could be contaminated with gluten - everything from cooking utensils to anything with a non-stick coating to all my bakeware - we figured we would just focus on the whole room and finally get it done. 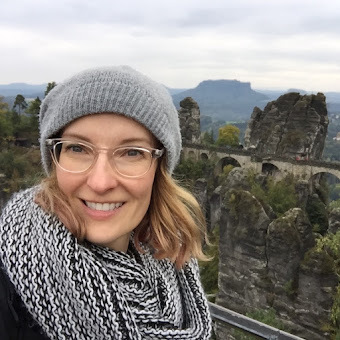 We had the basics in place, like bottom cabinets and our larger appliances, from our major Ikea kitchen design at move-in, but there were still many things left un-done. Unexpectedly buying all new cookware and appliances meant the cost to finish the rest - mainly wall storage and lighting - had to be kept in check. I decided I could live without fancier lighting fixtures and forgo the pricey solid stainless shelves I had wanted, so we headed back to none other than Ikea for the rest. 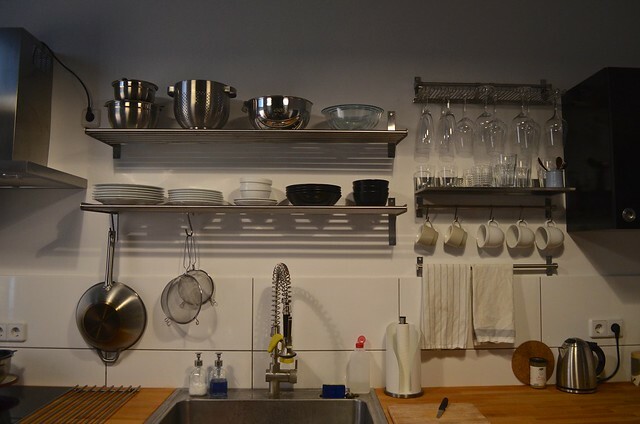 Instead of the EKBY shelves, we got the bargain GRUNDTAL for our plates and bowls, which also conveniently allows for hooks to hang pans and strainers on. 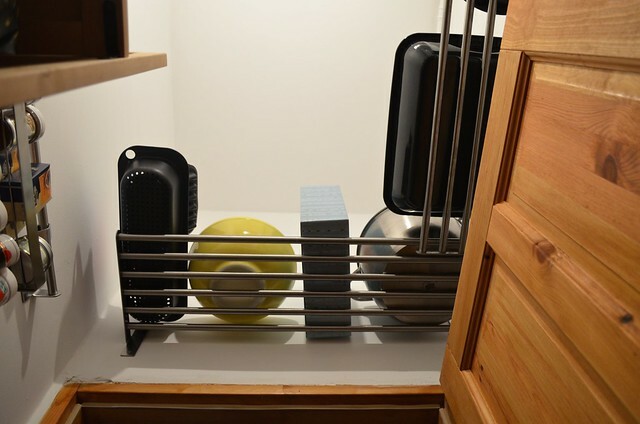 For smaller glassware, we used a combination of GRUNDTAL pieces - rods, hooks and wine glass racks - and a LIMHAMN shelf for drinking glasses that satisfied my craving for a solid stainless steel shelf at a reasonable price. Finally putting together the incredible 30€-a-piece UDDEN upper cabinets (now discontinued, I believe) we had bought months earlier and mounting them on the far ends of the main wall helped anchor the space, not to mention gives us some place to throw more cluttered items that we can keep out of sight. My beloved knock-off string shelves (scored on a Monoqi flash sale) on the opposite wall were put up with the plans of displaying food stuffs in glass jars to inspire cooking from scratch, so I finally got around to adding the Weck glass I'd been coveting to my collection of Ikea jars for convenient storage. I was smitten since the first time I was served Müsli in one of those adorably glass-lidded, strawberry-logoed little gems one brunch back in Wiesbaden. 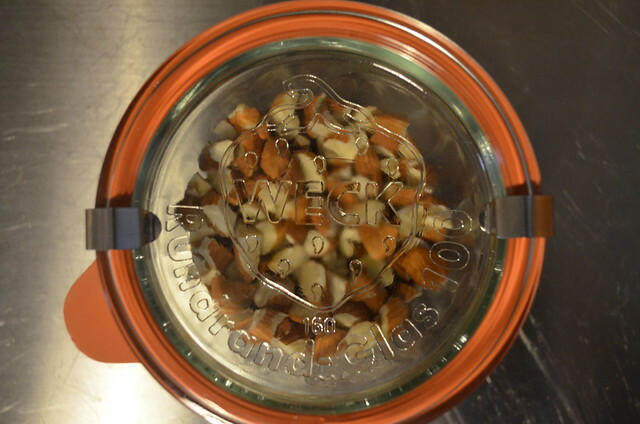 Even better, I since discovered that, conveniently living in the country that Weck glass hails from, it can be ordered directly from the manufacturer at a fraction of the cost it is in stores or on Amazon. So I bought a few different-sized sets, all with the same size opening for mix-and-match tops, along with glass and Tupperware-like lids. Now they act as display, storage and leftover containers in the fridge, and the smaller ones are even the perfect size for yogurt or dessert bowls. I can't recommend these seriously hard-working multi-tasking containers enough. 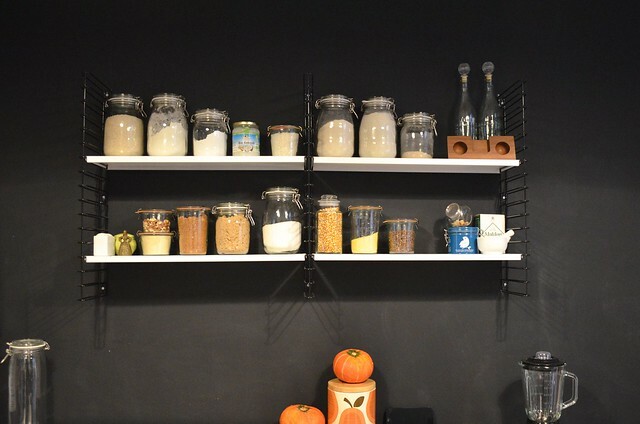 The pantry - which we are incredibly lucky to have in Europe, land of almost no built-in storage - worked out just fine with a combination of old shelves that we had brought with us from the States and from our previous apartment, including high storage above the door. In my dreams, there would be clean, coordinated built-in shelves all the way around, but there are realities to accept (1) when you rent, and (2) when you are an expat that may decide to move to another country on a whim, which makes such permanent investments frivolous, at best. 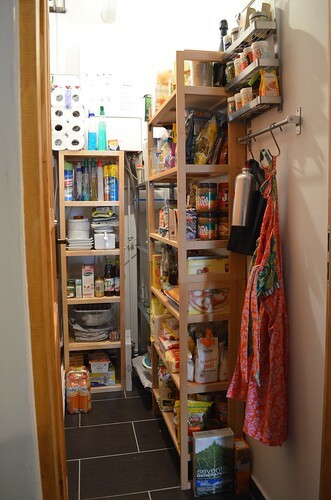 We have plenty of space for food, dishes and cleaning supplies in there, which is more than good enough for me. Finishing touches like lighting and other decor proved easier and more affordable than originally planned. I stopped fighting the aversion to all-things Ikea and decided on the RANARP fixtures, which I love and already have small wall-mounted ones above our bathroom sink. 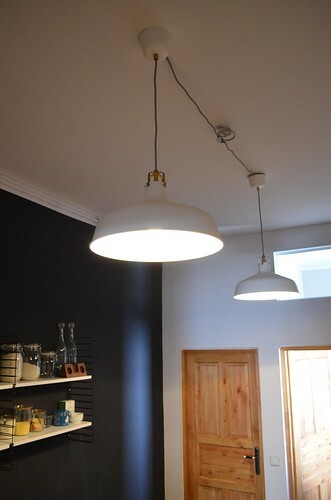 The gold accents and black-and-white knit cords add just enough special detail to elevate these from just another cheap fixture to something clean, modern and worthy of a more design-oriented look (they're also on serious special right now at Ikea Germany through mid-November!). Going from one fixture to two in this window-less room has made all the difference in the world. 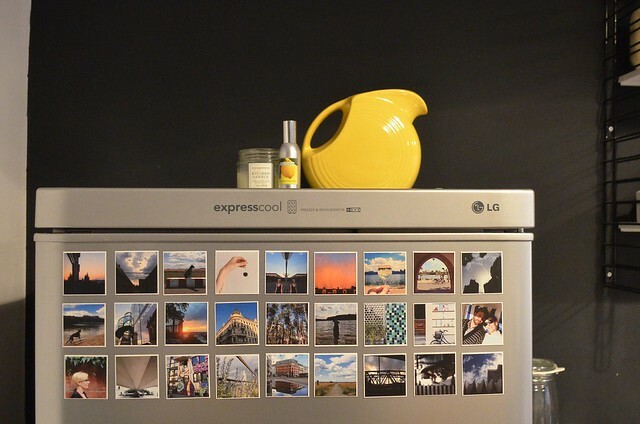 A small but impactful detail was the addition of Instagram magnets (via Sticky9) on the fridge. They are fantastic for getting all those Instagrams that sit virtually on your smartphone into real, tactile life while making a uniform and organised display out of something personal. I must say for the price I was expecting a bit more substantial magnets with crisper image quality, but as someone who is hardly crafty enough for DIY and with its generous three-for-two set deal a few months back, it was definitely worth it to bring colorful pops to an otherwise black and white room. 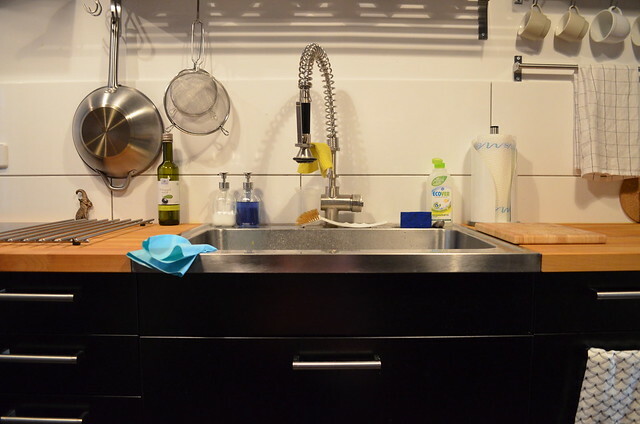 It's also worth noting that the extra large, stainless steel sink I had my heart set on back when we fist designed our kitchen, the one that every single Ikea employee who helped us fought me on because of the concessions it meant for the rest of cabinetry to be built around it, remains one of my favorite parts about our kitchen. It's deep enough to not have to do dishes the minute they get dirty without that pesky pile-up around the sink (OK, not usually) and the extra-wide cabinet below perfectly houses all our recycling bins (German are serious about recycling - I've even heard you can be fined for doing it wrong), keeping them organized and out of sight. The only small complaint I have is for the heavy-duty faucet I chose, which while convenient and damn gorgeous, sits a bit too high above the sink and often ends up spattering my counters with water profusely when I wash dishes. As always, I still feel there are little tweaks I'd like to do - more graphic neutral-colored linens, nicer lighting in the pantry, some under cabinet lighting for better food preparation and photography, and perhaps some framed art for the black wall - but at least now there is enough lighting that I won't unintentionally chop off a finger mistaking it for a carrot and a place to put most of our things. It's taken a bit longer than I'd like, but having a finished space that I designed myself (hooray for higher counters and cabinets for us tallies!) where I will be spending a lot of time working on my new life of gluten-free cooking makes me seriously happy, not to mention feeling even more at home.